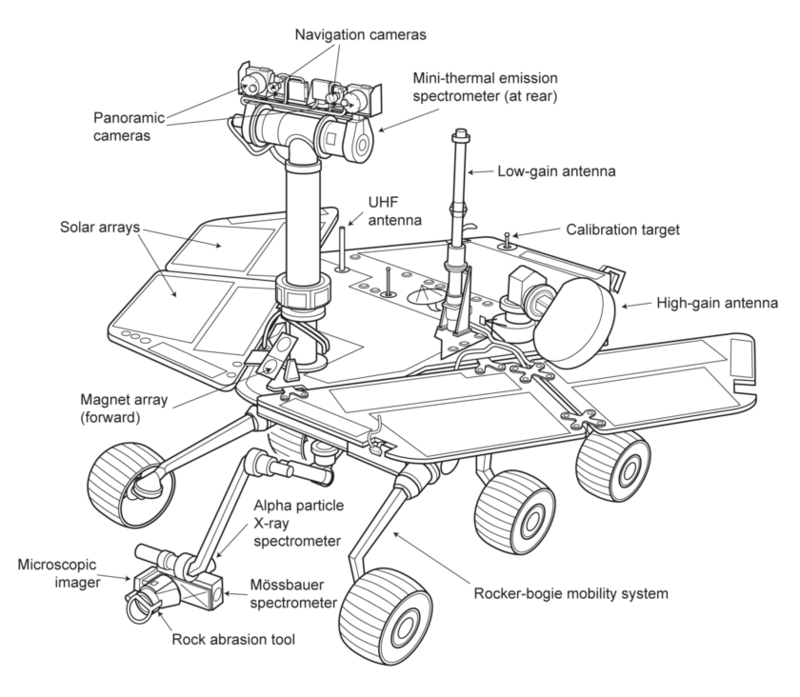 The twin Mars Exploration Rovers (MER), Spirit and Opportunity, were robot field geologists. They confirmed liquid water once flowed across the Martian surface. Both long outlasted their planned 90-day lifetimes. 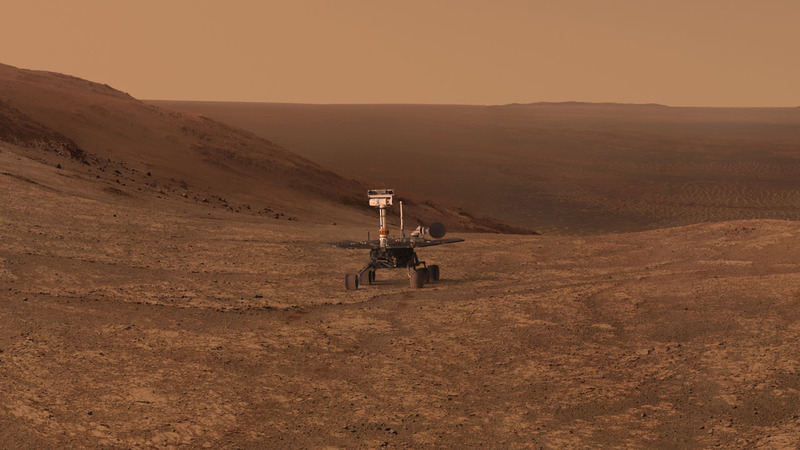 Following their landings on 3 and 24 January 2004, Spirit drove 7.73 kilometers and worked for 2210 sols (Martian days), until 22 March 2010. Opportunity drove 45.16 kilometers and worked for at least 5111 sols; the rover stopped responding on 10 June 2018, and the mission was declared over on 13 February 2019. Pictures taken from the rovers’ stereoscopic cameras captivated the public, giving us the feeling that we were standing on Mars. Before the landing, principal investigator Steve Squyres made the revolutionary decision of sharing all the rovers’ photos with the public as soon as they arrived on Earth. Because of that generosity, rover fans could follow the day-to-day adventures of Spirit and Opportunity in near real-time. The names Spirit and Opportunity were selected by NASA in a student essay contest that drew nearly 10,000 entries, sponsored by The Planetary Society and LEGO. The Society and LEGO also provided DVDs carrying the names of 4 million people. The DVDs remain in Gusev crater and on Meridiani planum as testaments to public love for Mars exploration. Spirit took this panorama on sol 1984 (August 2, 2009) at a local time of 7:00 a.m. The Sun had risen at 05:47. The originally black-and-white panorama has been hand-colored based on the colors from another, full-color panorama taken at a different time of day. After a long climb, Opportunity summited the highest point in its whole mission. This view look's across the wide Endeavour Crater. Searching for and studying many different types of rocks and soils that might hold clues to past water activity. Producing maps showing the locations of different kinds of rocks and soils around the landing sites. Determining what forces have shaped the landscape and how they created the landscape. Studying iron-containing minerals and uncovering minerals that contain water or must have formed in water. Identifying the minerals and textures in rocks and soils and determining how they were made. Searching for clues to what the environment was like when liquid water was present, whether the water was present for a long time or not, and whether the environment could have supported life. In Gusev crater, Spirit found evidence for both past and present water cycles. The rocks of the Columbia Hills had their minerals altered by percolating groundwater. Home Plate is the eroded remnant of an ancient volcanic fumarole, or opening, featuring hot springs of chemical-rich water like those in Yellowstone National Park. Dragging its wheel through the sand around Home Plate, Spirit turned up soils made of different layers of minerals. These layers were separated from each other in the geologically recent past, when thin films of water trickled in to the soil, dissolving some minerals and leaving less soluble ones behind. 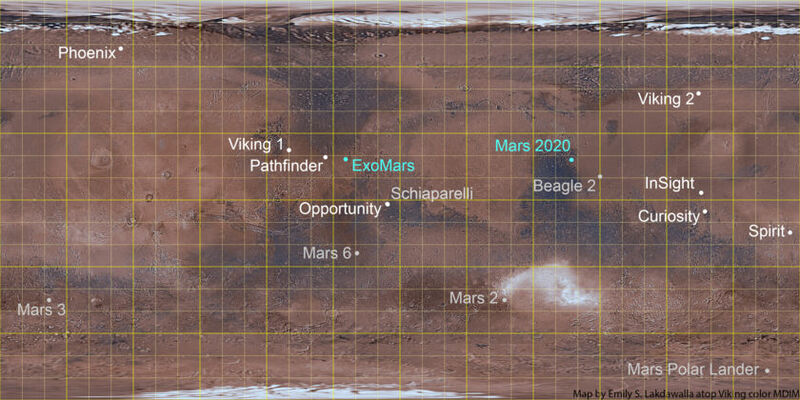 At Meridiani planum, Opportunity was the first mission to study intact sedimentary rocks on Mars. It examined tiny spheres of hematite, dubbed “blueberries,” and layered bedrock, to determine the geologic history of the region. The visual and chemical evidence suggests that a large, salty body of water once pooled on the surface, sometimes evaporating to form sulfate-rich sands that were eroded and redeposited by wind in a desert environment, and later altered by groundwater. In 2011, after nearly 20 kilometers of driving among sand ripples, Opportunity reached much older rocks in the eroded rim of an ancient crater named Endeavour. The rover had lost two of its four science instruments and was plagued with memory problems, but with help from Mars Reconnaissance Orbiter, it found evidence of more benign, wet environments in Mars’ even more distant past. "Our job was to wear these rovers out exploring, to leave no unutilized capability on the surface of Mars, and for Spirit, we have done that." "Just think of some of the things that have happened back on Earth [during Opportunity's mission]. The entire Obama Presidency. The entire existence of Facebook. The Boston Red Sox winning the World Series three times! We've been on Mars a very long time." 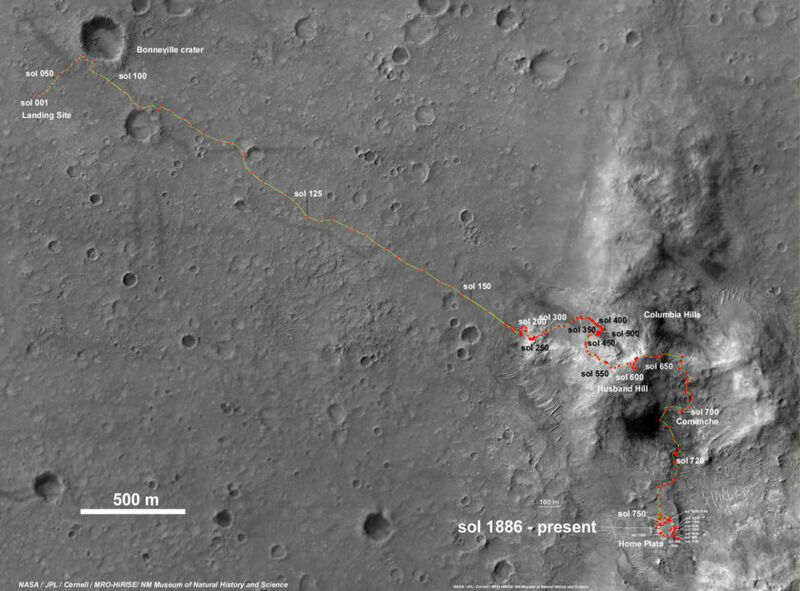 The two rovers landed nearly on opposite sides of Mars, a fact that facilitated mission operations and communications planning. Spirit landed on the flat floor of Gusev crater at 14.5692°S, 175.4729°E. Gusev is a 160-kilometer-diameter impact crater with a flat floor and subdued peaks. Ma’adim vallis, an 800-kilometer-long outflow channel, enters it from the south and exits it from the north, making it a near-certainty that water once ponded in Gusev. Once Spirit landed, science team members discovered that any sediments that might have been deposited in Gusev’s floor were later covered by volcanic deposits, so they took the rover to the Columbia hills in search of more ancient rocks. 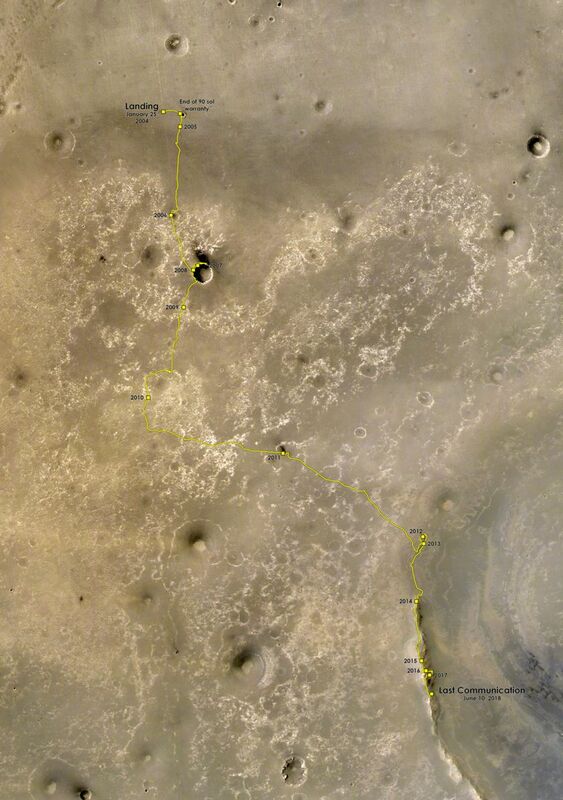 The Mars Exploration Rover mission's official route map, developed by Larry Crumpler. Opportunity landed within Meridiani planum at 1.948282°S, 354.47417°E. Meridiani planum contained large deposits of a dark-colored water-related mineral called hematite that were visible from orbit, as well as light-colored layered rocks. During its airbag-assisted landing, Opportunity fortuitously rolled into the 20-meter-diameter Eagle crater, which had punched a hole into the surface and exposed layered bedrock. Following work at Eagle, Opportunity embarked on a 15-year journey covering 44 kilometers of Meridiani planum and the rim of Endeavour crater, setting a distance record that is not likely to be broken on Mars for many years to come. The base image for this map is a mosaic of Mars Reconnaissance Orbiter Context Camera images that has been colorized with Mars Express HRSC images. During its 14.5 years on the Martian surface, Opportunity traveled 45.16 km from its landing site in Eagle Crater. The site of its last communication with Earth (and presumably its final resting place) at Perseverance Valley lies almost exactly 25 km as the crow flies from its starting point. Note: The Mars Exploration Rover team publishes many of their papers in the American Geophysical Union’s Journal of Geophysical Research, which makes all papers open-access 24 months after publication. Ray Arvidson et al. (2006): What are the blueberries, and where did they come from?